Like most towns established in the 1700's Upper Marlboro relied on water ways to support their economy. Moving people and goods by water was a very efficient transportation option. Settling near water comes with a risk of flooding. The information below has been gathered by first hand experiences and stories told by residents and business owners of Upper Marlboro in Soutern Maryland. How high can the water get? Residents of Upper Marlboro recall massive flooding before the U.S. Army Corps of Engineers installed flood control systems in between the late 1950's and the early 1960's. Some floods would cover large area's of the town from near Brown Station Road to almost Route 301. Below are links to photos and information about more recent flooding. There are several creeks converge in Upper Marlboro on their way to the Patuxent River. These creeks drain an 89 square mile water shed area that stretches from Route 50 to the North, to the 495 Capital Beltway to the West and Route 301 to the East. All of the storm or rain water from these areas must pass through Upper Marlboro before finding it's way past Route 4 to the South and finally into the river. In the late 1950's to early 1960's the U.S. Army Corps of Engineers designed and installed a flood control system to protect Upper Marlboro from massive flooding. Storage ponds and Burms or high banked hills were installed along portions of the Collington Branch with wiide open areas created as over runs to containing the high water near the creek. This flood control area can be most easily seen from Buck Lane just off or Route 202. Sluice gates were also installed. A sluice gate is a water gate that can be opened and closed to control water levels. Allowing officials to move water into storage areas reducing high water levels. In Upper Marlboro there are two sluice gates. One is located near the Railroad Bridge on the Collington Branch Creek. The second sluice gates is located near the Water Street Bridge on the Western Branch Creek. The sluice gate on the Collington Branch is oppened when water levels reach a certain height allowing water from the creek to fill Depot Pond. When water levels dictate the sluice gate near the Water Street Bridge is opened to reduce the water levels in Depot Pond. This process of moving and storing water when done properly can prevent flood water damage in Upper Marlboro. The Nation Weather Service maintains two useful water level gauges in Upper Marlboro. 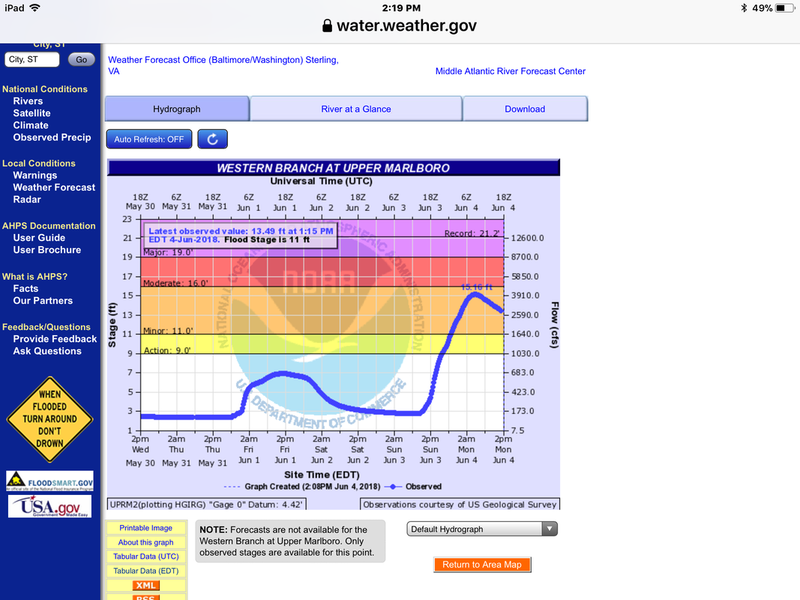 The first gauge monitors the water level of the Western Branch creek near the Water Street Bridge. 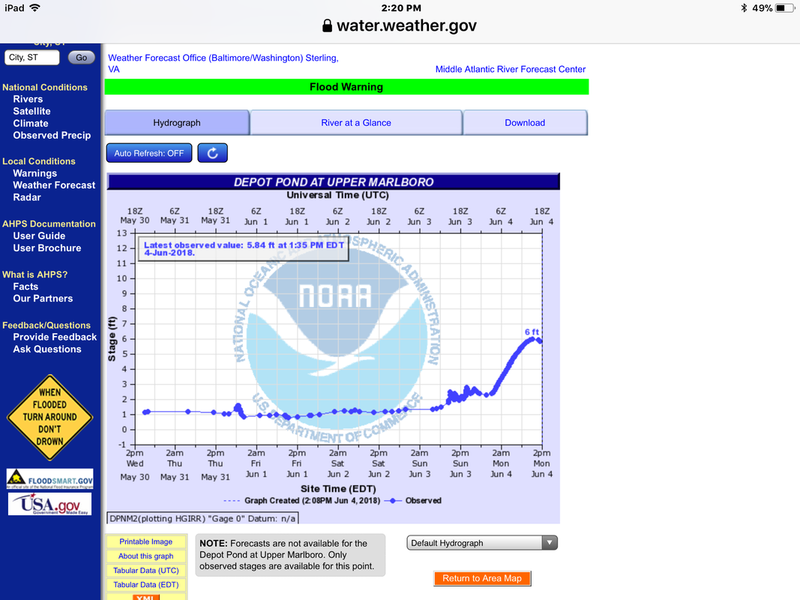 The second gauge reports the water level in Depot Pond. Gauge readings can be found on the internet by using the links below.